When leading high-end collectible company Hot Toys called for back-up in the Philippines, Filbar’s, the country's premier store for pop culture, stepped in to help assemble the most anticipated Marvel's Avengers: Age of Ultron Hot Toys Exhibition, running from April 27 to May 16 at The Block, SM City North Edsa in Quezon City. Among the most eye-catching highlights at the Philippine stop of Hot Toys’ Asia Tour are the ground-breaking life-size statues of Captain America and Ultron; the attention-grabbing, movie-accurate Avengers: Age of Ultron 1/6th scale collectibles that include Iron Man Mark XLIII, Captain America, Black Widow and War Machine Mark II; the all-ages, cute Avengers: Age of Ultron Cosbaby Series 1; and the Avengers: Age of Ultron: Artist Mix Series, a collaboration with Japanese artist Touma. “It is the also the best opportunity to take a closer look at Hot Toys’ high quality and greatly detailed 1/6th scale collectible figures and diverse product lines Cosbaby Series and Artist Mix, especially for fans who have watched the epic sequel. 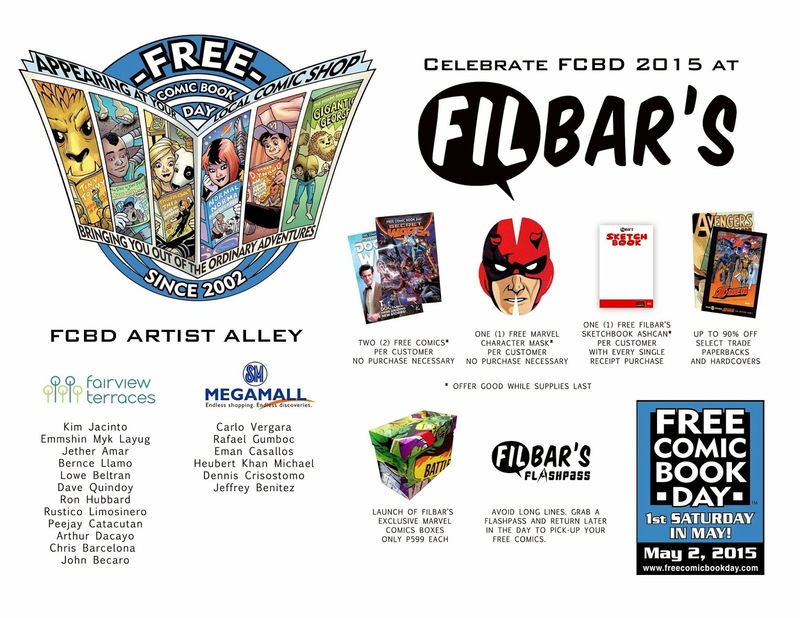 Filbar’s, which is the headquarters of the most passionate comics fans, is thrilled to be Hot Toys’ partner for the new collectible figures landing in Manila,” said Jacob Cabochan, Filbar’s President. Two exclusive collectible figures will only be available during the event period - the War Machine Mark II and Iron Man Mark VII, Stealth Mode. The figures are realistically designed to look even more like the armors as they appear in the film. The Iron Man Mark VII, Stealth Mode (P14,400), is likewise a great addition to fans’ Iron Man collection. The collectible figure features multiple layers and various shades of metallic and matte black color with digital camouflage design, translucent black chest armor and articulated flaps on back of legs, Stark Industries decals at various parts of the armor, LED light-up functions, interchangeable armor parts, and a dynamic figure stand. “Not only does this gives a fair chance to everyone who would like to take home these limited, movie-accurate Hot Toys collectibles, it also brings back pop culture fans to the comic book store to reignite their interest in reading comics, where blockbuster movies like Avengers: Age of Ultron were born,” said Filbar’s Creative Director Ivan Guerrero. Filbar’s is also covering all fields geeky this summer, starting with the release of the Philippine edition of Avengers: Age of Ultron Movie Magazine Special (P150), as Filbar’s now owns local publishing rights; exclusive licensed movie posters of Avengers: Age of Ultron and Guardians of the Galaxy (P299); and activities lined-up for the most exciting event this year, Free Comic Book Day, set on May 2 at Filbar’s SM Megamall and Filbar’s Ayala Fairview Terraces. For more information, like Filbar’s on Facebook (www.facebook.com/filbarsonline) or follow us on Instagram or Twitter (@filbarsonline). Join the conversation using the hashtag, #FilbarsHotToys.